In the spring of 2008, seventeen-year old Buffalo, NY, native Megan Mahoney, a freshman member of Marist College’s women’s crew team, was preparing for the team’s spring training trip. “The day before we left, we all had to go to this big meeting,” says Megan. “I was sitting with my teammates in the auditorium when all of a sudden everything got dim.” Teammates later told her “they saw my eyes roll back in my head and I just fainted.” When she came to, her teammates walked her down the hall to the school nurse’s office, where she fainted again. An ambulance brought her to nearby Poughkeepsie Hospital where doctors ran tests, but could find nothing wrong. “They said I was fine, but when I stood up to go home, I fainted again. I fell right onto the floor in front of the doctor.” They checked her in for the night and performed a CT scan. The CT scan showed a mass in her brain. Megan cancelled her spring training trip and had an MRI. A Buffalo-based neurologist told Megan and her parents that the mass in her brain was likely a benign, fluid-filled tumor known as an Epidermoid Cyst. An Epidermoid Cyst is a slow-growing, benign, fluid-filled tumor that is usually found on the skin. The treatment of the cyst will depend on its location. If it is not symptomatic, it can be left alone. While the cause of only about one percent of all brain tumors, an Epidermoid Cyst that forms abnormally in the brain during fetal development has the potential to disrupt vital function. The only treatment is complete surgical removal. Megan and her family began the search for a neurosurgeon. “My mom quit her job to research. . .the best [neurosurgeons] in the world and in the U.S.,” says Megan. Neurosurgeons at the biggest and best hospitals up and down the East Coast offered differing opinions. Some told Megan and her parents that the surgery was too risky, while others recommended immediate surgery. 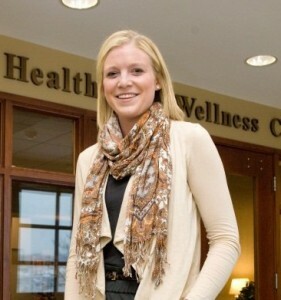 By mid-January, Dr. Sisti gave Megan the go ahead to start rowing again. Megan was back in school by the end of the month and she has been symptom-free ever since. Note: Megan Mahoney, member of EBTS, has graduated from Maurer School of Law at Indiana University in Bloomington, Indiana. She is living the life she always imagined for herself!